Christmas tree ornaments are fun projects to knit and wonderful gifts to give to friends and family. These rosy-cheeked little snowmen are bundled up against the cold with a warm winter hat and a cozy scarf around their faces. 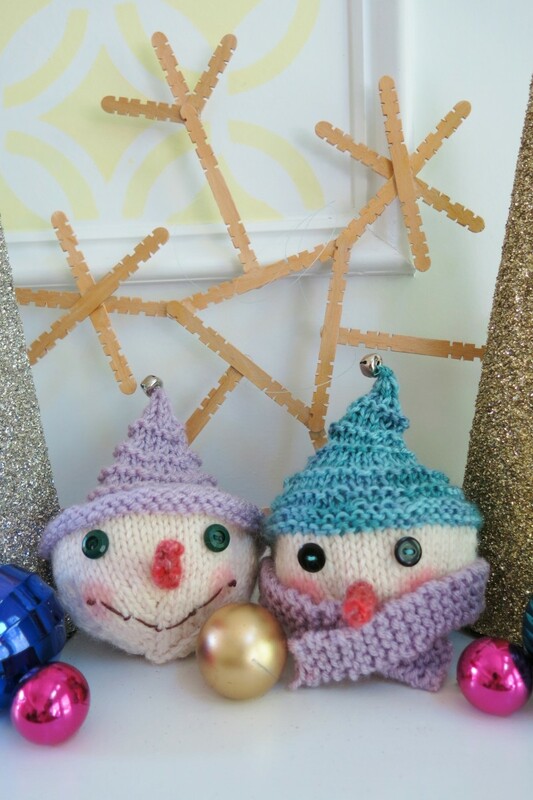 For this pattern, the snowmen's heads and hats are knit as one piece in the round. Each snowman can be personalize with your choice of materials for their facial features and winter attire. 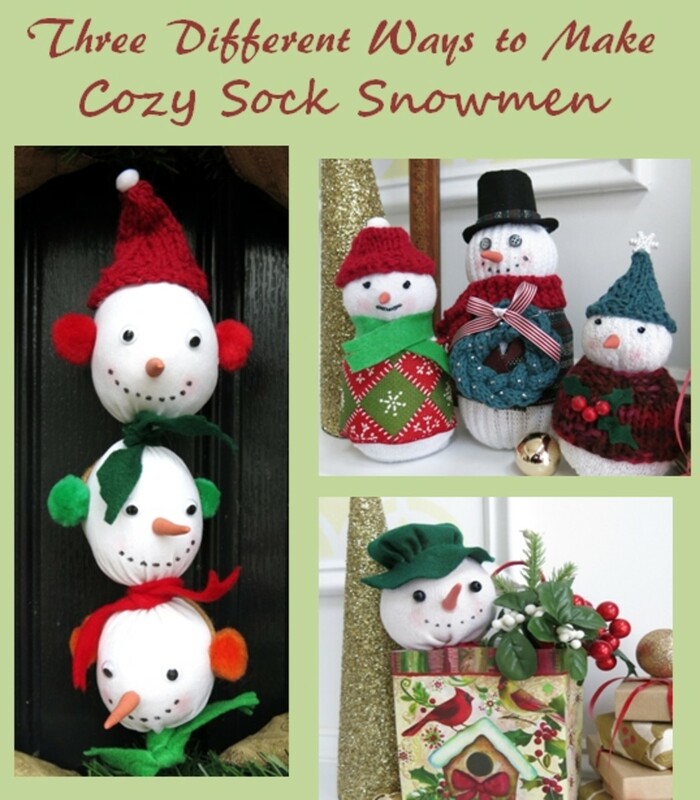 These snowmen are a quick knitting project. Each can easily be knit in a few hours. I used scrap yarn for mine and spent most of my time choosing yarn and buttons to finish them off. Gauge: 19 sts x 28 rows = 4 inches in Stst, though gauge is not very important. 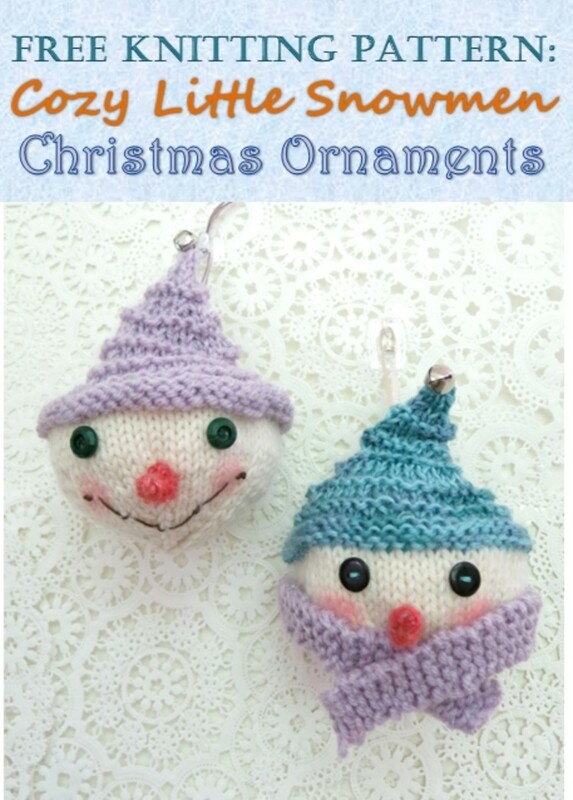 You can actually use any weight yarn and needles you want for these ornaments, just make sure your knitted fabric is tight. 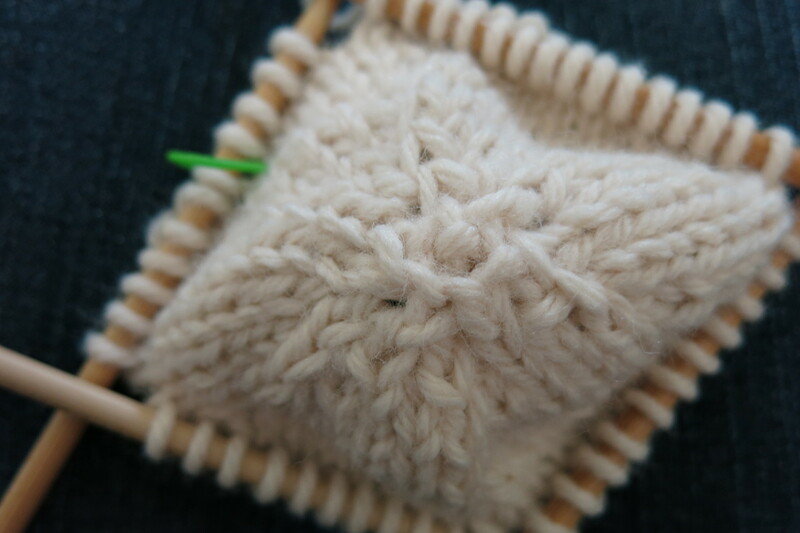 Your finished decoration will probably be a different size if you do not knit following the gauge listed above. Finished Size: My ornaments are about 7 1/2 inches from base to the top of the hat, and about 13 inches in circumference, not including the nose. The snowman's head is about the size of a large manufactured Christmas ball. Stuffing: I would suggest using fiber fill or cotton balls to stuff your ornament. 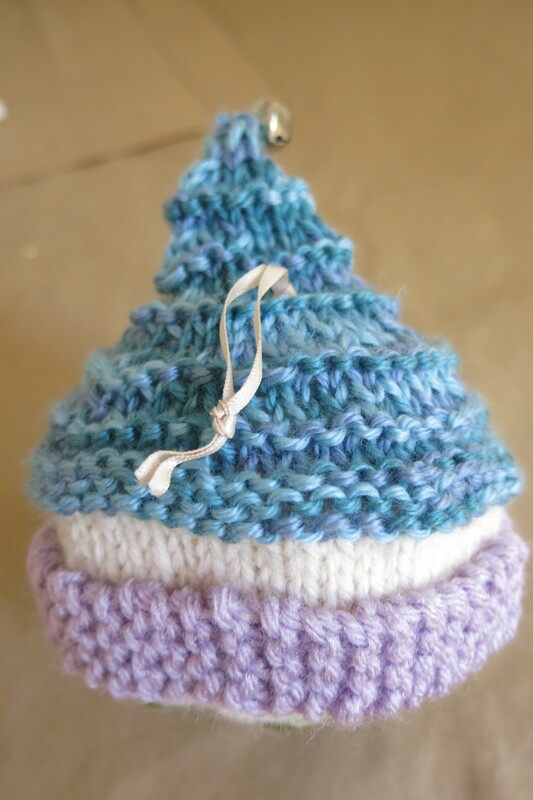 Hat: You can add a pom pom, bell, bead, or star to the end of your snowman's pointed hat. Eyes: You can either use buttons, beads, or googly eyes. Craft stores also sell safety screw eyes for toys that you can add. Nose: You can either knit a little nose with an i-cord as I did, or use a button. Scarf: I've included my knit pattern for my scarf below, but you could also use a piece of felt or fabric. Mouth: If you don't want to wrap your snowman in a scarf, you can add a mouth made with a row of buttons or some simple embroidery stitches. Starting with your white snowman yarn, cast on 6 sts on 3 dpns leaving an 8 inch tail. 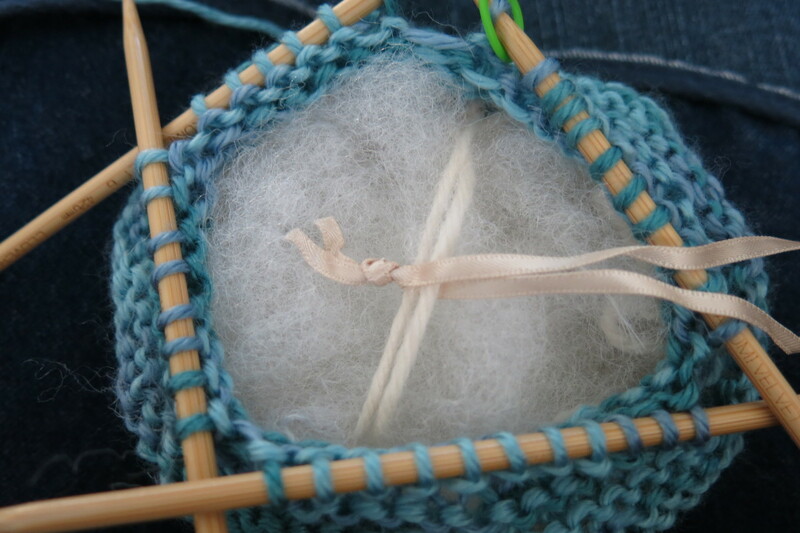 Place your marker at the end of your cast on stitches and join in the round for knitting. Be careful not to twist your stitches. As you increase your number of stitches, add more dpns as needed. Rnd 2: *K1, inc1* all around (12 sts total). I used a right lifted increase for this pattern. For the last increase in the round, I actually slid my marker for the next round and used the first stitch on the next round as the base stitch for my increase. Next step: Using the tail of your cast on yarn, pass the end through your cast on stitches and carefully darn up the center hole of your ornament. Then cut your white yarn, leaving a 10 inch tail. Rnds 23 - 25: Purl all sts. This will create the band of your snowman's hat. Next Step: Now is a good time to stuff your snowman's head. As your filling the head, check from the outside to make sure you are creating a nice rounded shape. If you want to make a sloping hat as I did, follow these instructions: Take your white cast on tail, weave it in a few stitches at your ending spot, then weave it through a few stitches directly across from your ending spot (see photo above). Do not pull too tightly - you want to maintain the round shape of your snowman's head. 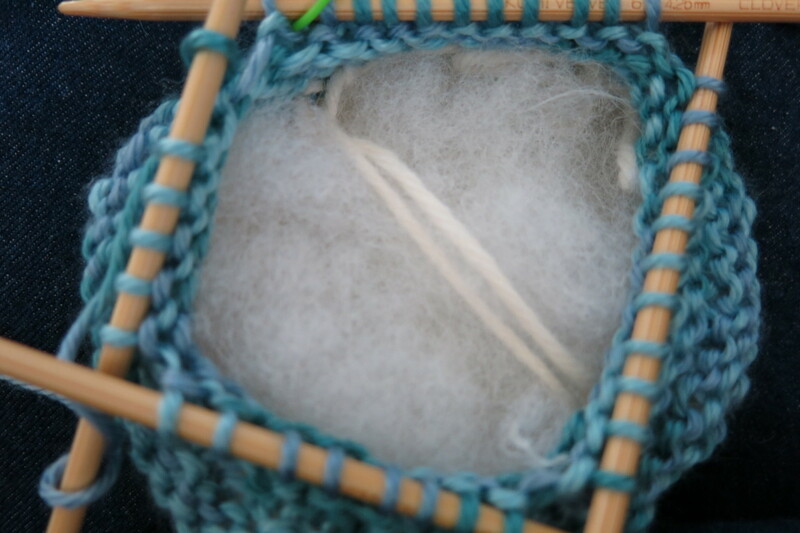 Then you can bring it back to your starting point if you want and weave it in to end. 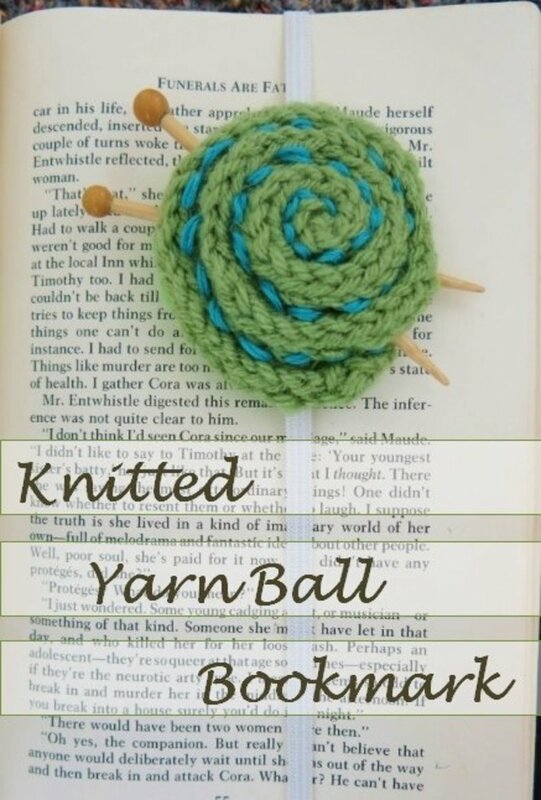 Now attach a loop of string or ribbon to the yarn crossbar you just created. Leave your ribbon curled in the center of your ornament for now as you continue to follow the pattern for the hat below. Rnd 42: Knit all sts. Next step: If you are making a sloping hat, at this point pull your hanging ribbon out toward the back of your ornament and let the end hang between your stitches. You may want to look at your ornament and decide on which side is the front and which side is the back. 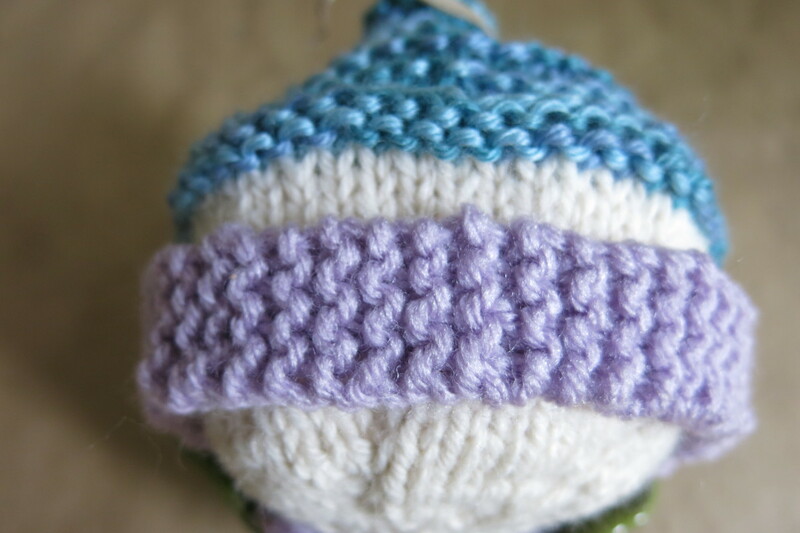 Continue to knit the pattern below, leaving your ribbon end outside of your ornament. Do not stuff your snowman any more. Only his head should be stuffed, leaving his hat empty to sag. When your ornament is complete, tie a knot in your ribbon or string where it meets the hat. This will help your decoration hang straight. Rnds 52 to 54: Knit all sts, then cut yarn and pull through remaining stitches. Weave in your end to secure stitches. 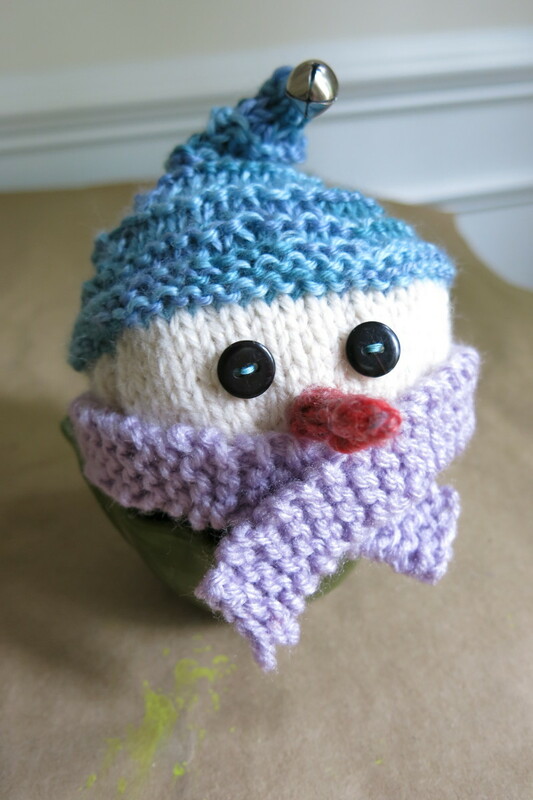 Scarf (optional): I think my snowman looks pretty cute bundled up in his scarf, but this is completely optional. I knit my scarf, but you could also use a 3/4 inch wide piece of felt as a scarf. Test wrapping your fabric around your ornament before cutting the length. You can also cut little fringe pieces into the ends. 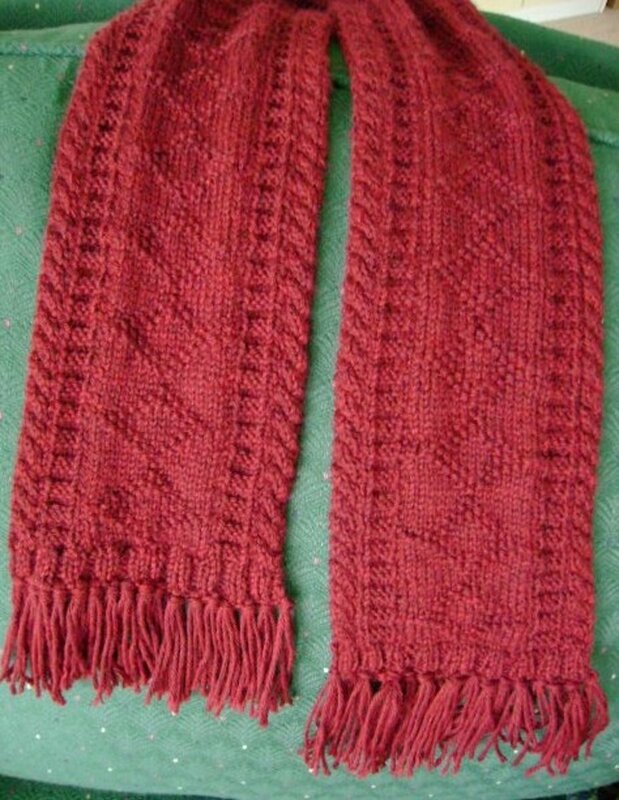 To knit my little scarf, I cast on 4 sts on #8 needles and knit in garter stitch until my scarf was about 15 inches long. I would check the length by wrapping it around your ornament before binding off. I used hot glue to attach my scarf to my ornament, but you could also sew it in place with a needle and thread. Using the hot glue, I attached the center of my scarf in the back middle of my ornament. I then turned my ornament and slowly worked toward the front. When both sides were glued in place, I crossed my scarf ends over in front and glued them down. Nose: I knit my nose as an i-cord, but you could also use a button or a pointed piece of wood painted orange. 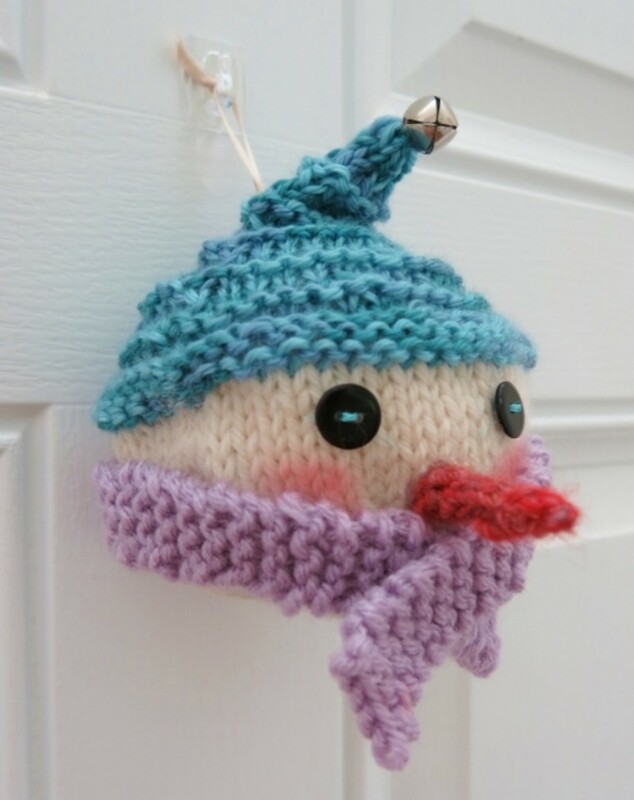 To knit a nose, take a piece of scrap yarn in the color of your choice. Cast on 4 sts on small dpns (I used #4 since that's the smallest I have) and tightly knit an i-cord that is about 3/4 inch long or whatever length you choose. 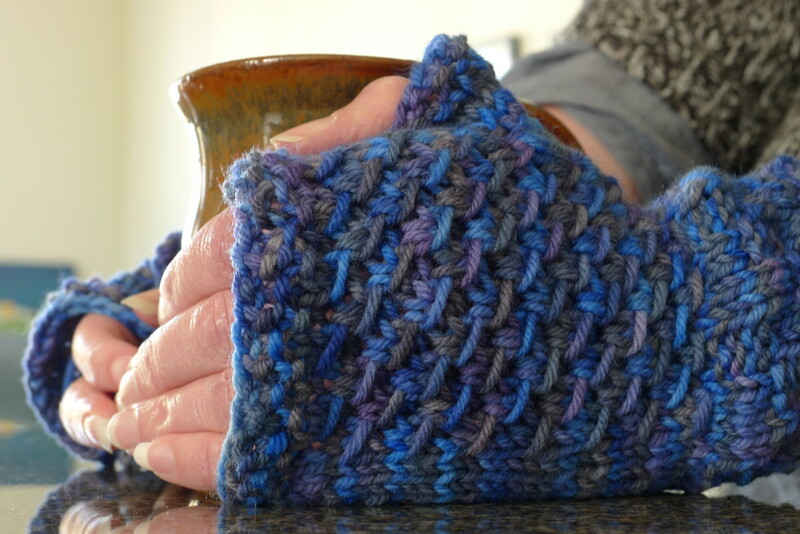 Bind off your stitches and weave in your yarn end, maintaining the point that your bind off naturally creates. I attached my nose with hot glue, but you can also sew it on. I placed my nose right in the "v" created by my scarf ends crossing over. Eyes: Buttons or beads make great eyes. I think placing the eyes wide apart make these snowmen look cuter. Rosy Cheeks: I used pink chalk pastel to add some rosy cheeks. Cover the scarf with a tissue as you apply the pastel and use it sparingly to build the color on your snowman's cheeks. Mouth: If you don't want to add a scarf to your snowman, you can give him a happy smile instead. You can use a row of small buttons to create a mouth or sew one on using embroidery floss. This pattern is copyrighted (©) 2016 Donna Herron. No part of this pattern may be copied or reproduced in any way without permission from the author/designer. For personal use only. This pattern and materials made from this pattern are not meant for commercial sale. 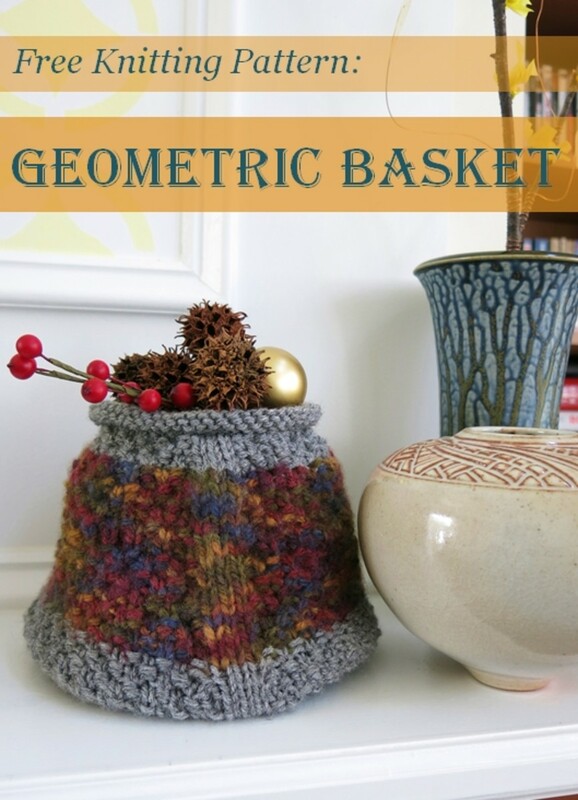 Hi Helen - Thanks so much for your interest in my knitting patterns and articles. 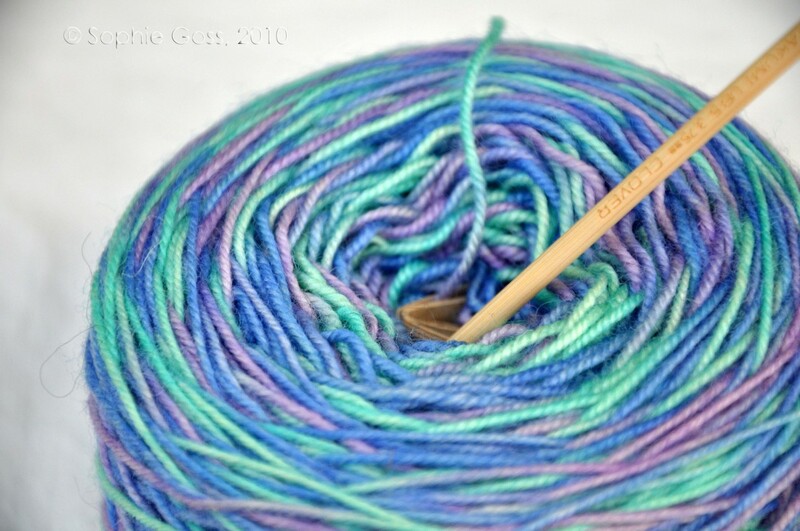 My username on Ravelry is purl3agony. Look forward to connecting with you! Hi, is there a way to signup to receive your emails? Maybe follow you on Ravelry? Hi Lynsey! Thanks, as always, for your comments. I think you would enjoy knitting. You can probably find a crochet pattern to adapt on Ravelry.com if you want to make similar snowmen in crochet. Thanks again! Hi, these are so cute! I wish I could knit! I think I will have to learn a new skill! I do wonder whether it could be adapted for crochet? (another skill I have yet to learn!) 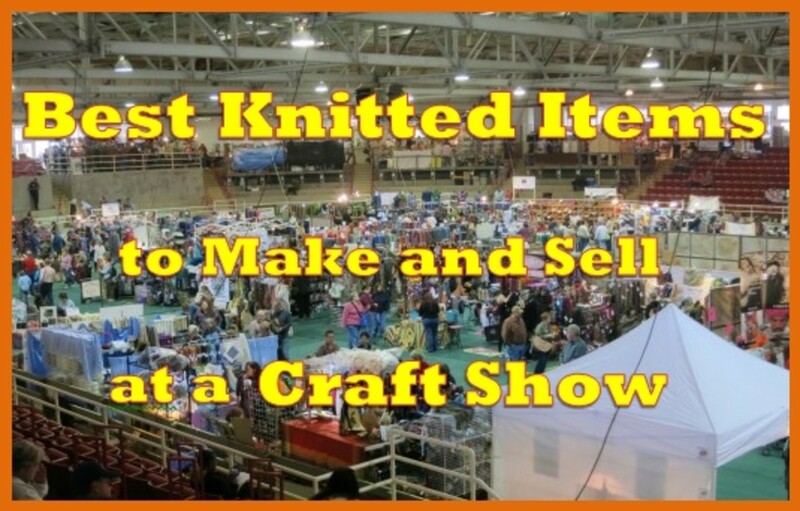 So many crafts, so little time! Hi Heidi - Thanks so much! 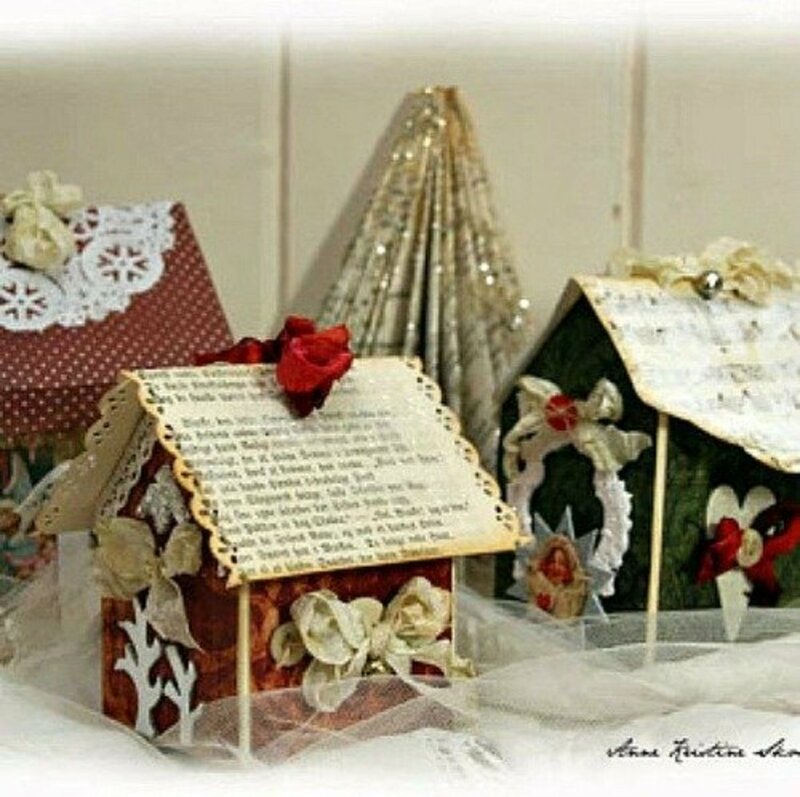 I have a lot more Christmas craft projects in the works, so I'm posting them as I make them :) Thanks so much for your comments! I appreciate it! Hi Sally - So glad you like these little snowmen! I'm sure that if you have a problem knitting these snowmen, you will find a way to make some with felting instead :) Looking forward to your upcoming projects! So cute... even though we're heading to spring. :) Don't forget to repost this around the holidays. Keep the cute stuff coming! Those little snowmen are real cute. I think they might even be within my knitting capabilities:) Great images and very clear instructions and in good time for Xmas.